Most induction motors are started directly on line, but when very large motors are started that way, they cause a disturbance of voltage on the supply lines due to large starting current surges. To limit the starting current surge, large induction motors are started at reduced voltage and then have full supply voltage reconnected when they run up to near rotated speed. Two methods used for reduction of starting voltage are: Star delta starting and Auto transformer starting. This is the reduced voltage starting method. Voltage reduction during star-delta starting is achieved by physically reconfiguring the motor windings as illustrated in the figure below. During starting the motor windings are connected in star configuration and this reduces the voltage across each winding 3. This also reduces the torque by a factor of three. After a period of time the winding are reconfigured as delta and the motor runs normally. Star/Delta starters are probably the most common reduced voltage starters. They are used in an attempt to reduce the start current applied to the motor during start as a means of reducing the disturbances and interference on the electrical supply. There are two contactors that are close during run, often referred to as the main contractor and the delta contactor. These are AC3 rated at 58% of the current rating of the motor. The third contactor is the star contactor and that only carries star current while the motor is connected in star. The current in star is one third of the current in delta, so this contactor can be AC3 rated at one third (33%) of the motor rating. Contactors (Main, star and delta contactors) 3 No’s (For Open State Starter) or 4 No’s (Close Transient Starter). Time relay (pull-in delayed) 1 No. Three-pole thermal overcurrent release 1 No. Fuse elements or automatic cut-outs for the main circuit 3 Nos. Fuse element or automatic cut-out for the control circuit 1No. In operation, the Main Contactor (KM3) and the Star Contactor (KM1) are closed initially, and then after a period of time, the star contactor is opened, and then the delta contactor (KM2) is closed. The control of the contactors is by the timer (K1T) built into the starter. The Star and Delta are electrically interlocked and preferably mechanically interlocked as well. The ON push button starts the circuit by initially energizing Star Contactor Coil (KM1) of star circuit and Timer Coil (KT) circuit. When Star Contactor Coil (KM1) energized, Star Main and Auxiliary contactor change its position from NO to NC. When Star Auxiliary Contactor (1) (which is placed on Main Contactor coil circuit ) become NO to NC it’s complete The Circuit of Main contactor Coil (KM3) so Main Contactor Coil energized and Main Contactor’s Main and Auxiliary Contactor Change its Position from NO to NC. This sequence happens in a friction of time. When the motor is disconnected from the supply (open transition) there is a spinning rotor within the stator and the rotor has a magnetic field. Due to the low impedance of the rotor circuit, the time constant is quite long and the action of the spinning rotor field within the stator is that of a generator which generates voltage at a frequency determined by the speed of the rotor. When the motor is reconnected to the supply, it is reclosing onto an unsynchronized generator and this result in a very high current and torque transient. The magnitude of the transient is dependent on the phase relationship between the generated voltage and the line voltage at the point of closure can be much higher than DOL current and torque and can result in electrical and mechanical damage. The auxiliary contactor and resistors are connected across the delta contactor. In operation, just before the star contactor opens, the auxiliary contactor closes resulting in current flow via the resistors into the star connection. Once the star contactor opens, current is able to flow round through the motor windings to the supply via the resistors. These resistors are then shorted by the delta contactor. If the resistance of the resistors is too high, they will not swamp the voltage generated by the motor and will serve no purpose. In closed transition the power is maintained to the motor at all time. This is achieved by introducing resistors to take up the current flow during the winding changeover. A fourth contractor is required to place the resistor in circuit before opening the star contactor and then removing the resistors once the delta contactor is closed. Low Starting Torque: The star-delta (wye-delta) starting method controls whether the lead connections from the motor are configured in a star or delta electrical connection. The initial connection should be in the star pattern that results in a reduction of the line voltage by a factor of 1/√3 (57.7%) to the motor and the current is reduced to 1/3 of the current at full voltage, but the starting torque is also reduced 1/3 to 1/5 of the DOL starting torque. The received starting current is about 30 % of the starting current during direct on line start and the starting torque is reduced to about 25 % of the torque available at a D.O.L start. This starting method only works when the application is light loaded during the start. If the motor is too heavily loaded, there will not be enough torque to accelerate the motor up to speed before switching over to the delta position. I have e-motor 7.5 hp driver driving 10 kw AC alternator, what value of mc should I use and model of the timer and o.l. kindly send to me a proper diagram of control circuit and power circuit, I am novice electrician. Sir, This is regarding the 3 phase squirrel cage induction motor of 400/440 V, 3 phase, 50Hz, AC, 1500rpm, 200HP motor, During starting it is fine but when it changes from Star to Delta, the said motor gets tripped. So in this view i would like to seek your good advice to move way forward. I’m having a problem that the circuit breaker protecting the circuit trips when the delta contactor is energized. Why does the circuit breaker protecting the circuit trips when the delta contactor is energized? Cause in star it didn’t. I did replace the breaker since it was defective and it ran for a couple of days, but I’m back at square one since it’s tripping again. In this case, your delta connection(Output) wrong phase. Changed the phase sequence. Hope it will be solved. Thanks. When switch star to delta (low to high load ) any specific time need? YOU HAVE CONTROL SYSTEM THRU BLUE TOOTH OR REMOTE SYSTEM CONTROL WITD 20 METER RANGE. DUE TO UNDERLINE POWER SUPPLY FOR SAFETY REASON BOSS,MADAAM. In the diagram of Power Circuit of Star Delta Starter, U2 and V2 of 3 phase motor should be connect to 4 and 6 respectively instead of U2 and V2 are connected to 6 and 4 of Delta Contector KM2. There is minor correction is require to change (printed in boxes) sequence of 3 phase wires from W2 V2 U2 to W2 U2 V2 to get Delta connection properly. Please check my comment by qualified person because I am not in electrical line. In-rush current time duration is very low. If you looked at the power dissipation over time, it does not carry enough energy to create significant heat generation through I^2R losses due to the thermal inertia of the Cu/Al material. To size a cable for 6 times the nominal load current would be a massive waste of resources and money. I HAVE A STAR DELTA STARTER FOR 5.5KW MOTOR ,ITS MCB HAVE A RATING OF 32A ,BUT DURING STAR TO DELTA TRANSITION MY MCB TRIPS, WHILE I RUN THE SAME MOTOR BY A VFD THEN MCB IS NOT TRIPPING, PLS EXPLAIN WHY TRIPPING OF MCB OCCURS ? the star delta stater has correct voltage and frequency to main and auxiliary circuits.when the start button is operated a single contactor is hard to operate, but the motor does not run.whent the start button is released,a contactor is heard to move again? One of the best Knowledge and True information i have got. But I have to size the transition resistor for the star-delta closed transition starter of a ID fan motor of 160kW, 400V, 50Hz, 4 poles. Please provide me with the value of resistances (ohms) and power (Watts). In a star-delta connection, does the speed change when the the motor change from Star over to Delta? the motor terminal should be UVW VWU or UVW WUV. hii sr i need ats pannal coontrol diagram can you some help me…? Is there any solution for the contactor stucking of 55KW or 260KW motor in star delta starter, these motors are running very high torque. Due to conntactor stucking many timer motor winding burnt. So pl do the needful. I got a burn accident in the motor rewinding because the missing interlock between delta contactor with the main contactor. The delta was stuck mechanically while the main is closed! If interlock the main (KM3) with delta (KM2) could solve the problem, but there will be a millisecond open in the Main contactor during the changeover. the milisecondes open in the main contactor during the changeover could cause any problem? with inquiry i came to know the capacity required will be 40KVA !! We are Trading Company in Sri Lanka and doing Tender business with Govt Institution. Please send the your price with delivery period. Circuit is wrong. Please correct it or remove the diagram. Very informative. appreciate the explanation. In the star delta diagram it is giving the impression that the V1 and V2 will be connected together when in delta configuration. THE STAR DELTA STARTER DIAGRAM IS WRONG(Diagram with heading star delta starter and bottom power circuit of star delta starter).THE V1 AND V2 END OF WINDING CONNECTED TO SAME PHASE OR IN OTHER WORD SHORTED. What is the rating of MCCB for the branch circuit in terms of motor Full load current (FLA) when the starter is star delta ? Can we use 200%FLA for the MCCB rating as the starting current during wye delta starting will be less than that of the starting current compared with a DOL starter? 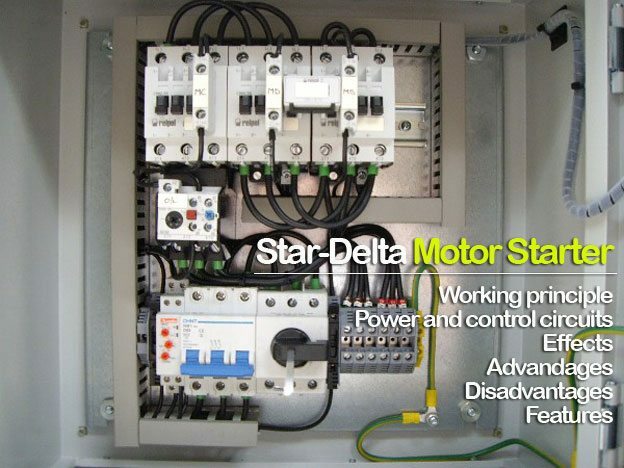 How can I do a power factor correction in a star-delta motor starter? what would be the safest location of an OL relay, inline or in winding? Can you make a video or lecture on how to connect the motor control circuit let’s say DOL/forward reverse/wye-delta in the motor connection box having 3 leads/6 leads/etc. Because I,ve known how to make control but then it confuses me on how to connect the 3 wires (3Ø) coming from the overload relay into the motor terminal leads. I’ll be waiting for your response..
Good,but carefully marked cable correctly as in V2,W2. Great mind,thanks for the lesson. Hi. I have a submersible induction Motor 30kW, this motor at no-load test started normally on star connection and during delta transition supply protection circuit breaker is tripping. on full load running condition in delta what load become if one resistance break? It seems that the connection of star delta contactor diagram above has a mistake, v2 and w2 were wrongly marked. I have gone through this basic article. It’s informative for the beginners. A correction needs to be made in power circuit wiring I.e. When delta contacter is energised U2 terminal must be connected to V1 terminal and V2 terminal must be connected to W1 of motor windings. Hope the writer shall agree. Am very grateful for the clear information and drawings, my pleasure. thanks u very much, i like the drawing traced in the website which is clear and detail drg. waitig in the future every electrical drawings/diagrams to get in my e-mail address. especially I need wiring ckt diagram of an ATS systems generator to line connection diagram, 2) controlling (managing) system of multi killo watt hour meters by one generator out put with out any interaption power. The v1/v2 winding in your diagram is connected to the same phase. This I think is incorrect as it needs to be connected across two different phases. please explain control circuit for star delta starter without timer. Which OLR range I should use? As per your given Fig. (Scheme – Control Circuit of Star-Delta Starter (Open Transition)). When the supply will on only timer coil energized But not pick up Main contact whenever it not get supply. as per my knowledge you have to interchange timer coil & main contactor coil idealy. Ideally process as per below. 2) Main contactor coil get supply & change it contact. 4) another main contactor contact will supply current to timer coil. 5) that time Star contactor coil get supply it will open delta contactor line. 6) after specific time Timer Contact change it will give supply to DELTA contactor. 7) When DELTA contactor get supply its contact will be change & open the STAR contactor line. In your system There is One more STAR contact required for supply main contactor. which ideally is not necessary. We need to install variable speed drive for 1x75kW Teco motor and 1x 160kW Teco motor at our Station. Currently the motors run using Star Delta. We will install VSD system for these two motors. When there is a need, we can swap from star Delta to VSD. We would like to check if using VSD will cause any damages to the motors. u r a teacher indeed. A news letter once in a while is not bad. hello sir, we design electrical control panel boards for rice industries. We presently worked on Asia’s #1 rice industry using programmable logic control. I need some more ideas which are newer and simpler to work. Can u please guide us. 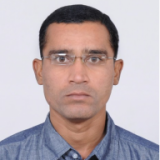 received good response about any technical item that was written to you for answer. Nice piece. Send me your Newsletters pls. Thank you for explaining it so beautifully that almost covered my doubts but Does FLC stands for full load current and what does IFL stands for. Sorry for asking immature questions. The “Power Circuit” in the above article has a flaw in it. In the way the motor are now connected, the “Yellow” (Y) supply phase is connected on both sides of the “V” winding resulting in no voltage over that specific winding. Therefore the motor will not run but would trip the overload (or even worse if the overload is faulty or oversized, the motor would burn) because the motor is in effect “two phasing”. In the drawing in the article above If we leave the “line side” of the main and delta contactors wiring as it currently are, then we need to swap around some “motor cables” on the “motor side” of the main and delta contactors to correct the error. How we swap them around depends on what rotation we need from the motor, “Forward” (also known as clockwise) or “Reverse” Reverse (also known as counter clockwise) rotation. This method of connecting is the correct way to connect the motor to the “Star-Delta” diagram as shown in the article above…that is, if you leave the wiring on the “line side” of the main and delta contactors as it currently are. Alternatively, to make the above diagram work correctly you could swap the wires around on the “line side” of the delta contactor in the diagram above that are connected to terminals 1 and 3. And leave the motor as it are currently connected to the contactors…this would have the same effect as my connection method mention above for forward rotation. Please Note: There is a misconception that you can “swap any two wires around” on a 3 phase Star-Delta starter to change direction but this is not entirely correct. The motor might indeed rotate in the opposite direction but if the wires are not connected in the correct sequence as I stated above, then you most probably would have the gotten motor’s “Phase Sequence” wrong, which would result in the development of very high current peaks in the “Open Transient Phase” when the Star-Delta starter is switching between the “Star” and “Delta” modes. These current peaks can be larger than the current peaks in the case of starting a stationary motor directly in the delta connection mode. This very large current can damage your motor and switching gear that would lead to premature failure of the equipment. Please note further: There are other versions of connecting the motor to the starter to obtain the correct “Phase Sequence”, the sequence I mentioned above is but one method. But REMEMBER this….just because it turns in the direction you want it to turn DOES NOT mean the motor is connected in the “Correct Phase Sequence”. There is a relation between windings of the motor and how they are connected to the supply and each other via the Star-Delta starter. This relation should strictly be adhered to for the optimal performance (and long levity) of the motor and starter switchgear. Someone have an idea of the impact of having one of the motor winding reversed (exemple: if wires U1-U2 and V1-V2 are connect normaly but W1-W2 are swapped. Because we have a 150Hp rewind motor with phase currents (delta windings) of 40A,18A,40A (once in delta mode, with no load). how come in your power circuit y phase is going to both v1 and v2 in delta connection. Thank you , It is very nice . How to use timear in starter with daegram? Im looking for Star Delta Starter. So any body can help me to find this kind of starter with below specs. i have a catalog as well. so kindly help me for this. If i have a 2700kW 11000V 4 pole motor and i wire it up to a VSD with an output voltage of 6350V. I will have to wire up the motor in star. Will the motor still be able to provide 2700kW in star? Hi, thank you for the great article. I was perusing it and attempting to redraw the ‘Power circuit of Star-Delta starter’ circuit myself to facilitate learning. I am having a problem with the connections from the Delta Contactor KM2 to the tap point on the mains lines before the Main Contactor KM3. Are these wiring connections correct? I know, EEP is working on this. thank u sir….plz keep posting u r new articles.. I APPRECIATE THE AUTHOR.THE EFFORT AND KNOWLEDGE IS REALLY GREAT. This circuit diagram is wrong .V1 and V2 is having same phase. Please elaborate on location of OL relay. If located at incoming line it would sense the FLC,why have you mentioned it as high?. When located in delta why do you need separate SC protection while already there is one in the incomer(MCB/MCCB/Fuse)?.